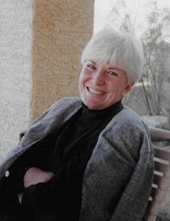 Patricia Statler Aeed, born September 26, 1937, in Phoenix, Arizona, passed away at her home in Prescott, Arizona on February 5, 2019. Patty was a scrabble whiz, a lifelong animal lover, a dear loyal friend with a warm heart, a supportive loving partner, an always willing to laugh soul who brought joy wherever she went, the most devoted loving, amazing Mom ever and the funnest, most generous loving Grandy. Grandy’s grand children were her heart and joy. Next to her grandchildren her beloved doggies were precious to her, she shared the road with many including Og and Blue who are waiting for her up in heaven and Scout and Ruby who miss her dearly but will be well loved down here. She is lovingly remembered by her sisters Anita, Joanne, and Barbie, her partner Bobby, her children Greg and Sumer and the grandchilden “Grandy” adored, Falone, Freda Rose, Austin, Charles Nicholas, Lily and Bella Rose. And so the story goes on until we see our Patty, Mom and Grandy again. We love you and miss you and so treasure all the memories in our hearts and every moment we shared with you. A celebration of her wonderful life is being planned in Scottsdale, for more information please contact Sumer at sumeraeed@icloud.com. In lieu of flowers please make donations to the Humane Society. To send flowers or a remembrance gift to the family of Patricia Statler Aeed, please visit our Tribute Store. "Email Address" would like to share the life celebration of Patricia Statler Aeed. Click on the "link" to go to share a favorite memory or leave a condolence message for the family.